Until recently, almost every room in Kirk Hammett‘s home was decorated with ghouls and creatures from the golden age of horror. During the past three decades, the Metallica guitarist has been collecting hundreds of billboards, placards and lobby cards depicting Dracula, Frankenstein’s monster and the Mummy, among countless others, and he always made a habit of displaying them all. “Every room that I had the posters in, I would always make sure I had a guitar and amp in that room for if they inspired me to play,” he says. Now he’s cleared more than 100 pieces from his walls for display in Salem, Massachusetts’ Peabody Essex Museum for the first-ever museum exhibition of his acquisitions. The show, “It’s Alive! Classic Horror and Sci-Fi Art from the Kirk Hammett Collection,” will be on view from August 12th through November 26th. A folio book – which follows up Hammett’s 2012 tome about his obsession, Too Much Horror Business – that features 90 images of many of the posters on display is also available, but many more items will be on display at the exhibition. In addition to Hammett’s acquisitions, the museum will also feature the debut of a new seven-and-a-half–minute piece of music the guitarist wrote specifically for exhibition called “The Maiden and the Monster.” “It’s something that I composed with my wife and it’s a musical horror novel,” he says. “It plays like a soundtrack. It clearly takes you through a journey that’s very typical of most monster or horror films, where it involves a creature or some sort of protagonist or antagonist who sees a woman and decides to abduct or possess her and then goes through the motions of either seducing her or outright abducting her. It goes through a little bit of an attraction-repulsion sort of thing, a love-hate thing, but then, there’s a definite period where the maiden needs help, tries to get away from the monster, and then the hero comes. When speaking with Rolling Stone, he also detailed why he loves 10 of the posters that will be featured in “It’s Alive!,” collected here. Courtesy of the Kirk Hammett Horror and Sci-Fi Memorabilia Collection and Universal Studios Licensing, LLC. That’s a very unique poster. It’s the only one known to exist. A big, revealing thing about this poster is that it credits the original director, Robert Florey, for the film, as well as James Whale [who stepped in later]. The story goes that Robert Florey was going to use Bela Lugosi as the monster. There was some shakeup at Universal, and, all of a sudden, and Robert Florey was taken off the job. James Whale came in and decided to use Boris Karloff instead of Bela Lugosi, and the rest is history. So knowing that story, on this particular French Frankenstein double grand poster, it credits both Robert Florey for story and production, as well as James Whale. It’s the only Frankenstein poster to come out during the original release to credit Robert Florey, so that’s why this poster is pretty interesting to me. Now the pure graphical representation of the poster is great. What is depicted is a scene from the opening of the film, where there is a funeral procession in a graveyard and they’re putting coffins into the ground – the typical thing, gravediggers throwing dirt on the casket. Then the next scene is [actor] Dwight Frye, who played Fritz, who later morphed into the Igor character, and Colin Clive, who’s Dr. Frankenstein, and they’re scheming to get the body. The image that you see on the poster is a part of that whole funeral scene, and then the image that’s superimposed over that is of idealized version of what the Frankenstein monster was. Back then, he was more thought of as part man, part machine, other than something that was put together using dead bodies. If you look at the stylization of the character, you’ll see that Frankenstein has a metallic appearance to him. That was the illustrator’s interpretation of what he thought the Frankenstein monster would be. That image is just so powerful. I’ll tell you a story about it. That image only existed in the Thirties, when the movie came out. But then, to any poster collector’s recollection, that was the last time that poster was actually seen, until one was found in 1989, which is the one that I have. For the first 30 years of The Mummy, the primary movie poster image was a different one; it was of Boris Karloff in the casket and it had his co-star down at the bottom. This one is of a giant shot of Karloff’s head, with a trio of people looking up at it. For me, it’s the ultimate image for that movie. Karloff’s head is just iconic. It looks godlike. You see all these rays shooting out of his head; the primary color scheme is yellow, orange and a dark-red crimson, which kind of invokes fire. The tag on it: “It comes to life.” Well, heck yeah, it should be coming to life. All this graphic imagery that suggests that it’s burning with life force. For the longest time, movie posters were the only accurate representation of what things actually looked like on set, because the movie posters and the people who were in charge of coloring the lobby cards had to sit on set and take notes about the movie, like what color clothing the actors were wearing, what color the characters’ makeup was and whatnot. For the longest time before that poster was found, everyone thought that maybe Karloff’s mummy was dirt-colored, dark brown maybe. But here, it looks bluish or greenish. The reason for that was because, looking through a black-and-white movie camera, it would read as a deathly pale pallor. It’s one of my favorite films. It’s actually a comedy, and a lot of people don’t realize that. Bride of Frankenstein was shot as a comedy, and it’s hilarious. A lot of people thought that the Bride’s hair was black with white streaks until some of these movie posters and lobby cards starting showing up that haven’t been seen in 30 or 40 years. Then people were saying, “Oh, yeah! That’s right. [actress] Elsa Lanchester had red hair!” So of course it was gonna be red with a white streak, which is supposed to be modeled after the Nefertiti bust. On the Bride of Frankenstein movie posters, a lot of depictions of the monster are with green makeup, but some are with regular facial makeup. To me, I don’t know why that decision was made – I like to see him green because that’s how he was on set. That’s one that I’ve had painted onto one of my guitars. I really like it because it has cartoonish aspects to it, whereas some of the other movie posters of Dracula are pretty intense. The reason for this one’s cartoonishness, I suspect, is that they knew how intense this movie could be for 1930s audiences, so I think they wanted to lighten it up a bit and come out with a poster that wasn’t as intense. When I look at that poster, there’s more comedic elements to its design than the other three or four posters that came along with that film.There’s nothing intensely scary about it. If anything, it just makes you curious. Why would a vampire be on a boat? But then you go and see the movie and it makes perfect sense. That film is a German expressionist tour de force, right out of the Weimar Republic, a very culturally rich time in Germany. A lot of the posters that came out of that period of moviemaking have that expressionist look to them. So the look of that poster, the angular look that’s behind that portrait illustration of the doctor, in the film and in the poster, supposedly represents a warped perspective on reality, which is what the doctor represents. That angular, crystalized, warped, off-shape sort of abstract design that the poster has behind the portrait is supposed to represent, basically, what reality looks like to the eyes of a madman. That’s one of my favorite posters. I tend to put all my favorite posters on guitars, obviously. I love the German expressionistic aspects of that film. The lettering of “Nosferatu” has an art deco, Weimar Republic feel to it. Back then, it was when there were a lot of different design aesthetics, especially with lettering, to make it look more than two-dimensional. The artist tried to make it look like the words were actually floating off the paper. If you use your imagination, you can see it. Again, that poster is one of the only accurate representations of what Nosferatu’s actual outfits looked like. Everyone knew he was a vampire, so he’s either green, blue or pale. But forever, people thought that his coat was either black, blue or burgundy red. But it turns out, from looking at this poster, that his coat was actually green. That kind of blows out all the artistic depictions of Nosferatu’s clothing that had come up to that point. All the movie posters in Germany were destroyed for Nosferatu because it was recognized as being a plagiarism of Bram Stoker’s Dracula. So Bram Stoker’s widow sent a cease-and-desist order to the makers of Nosferatu, and they moved to destroy all copies of the film, all movie paper, everything related to Nosferatu. And they did do that, but they didn’t go to other countries to destroy the copies of film that existed in, say, Czechoslovakia, which was where the best print of Nosferatu came from. Or to Spain, where my Nosferatu poster came from. The Nosferatu posters didn’t survive in Germany for two reasons: the cease and desist and also the World War. But in Spain, where they probably just read the cease and desist and just thought of it as business as usual. Spain wasn’t a huge battlefield during World War II. As a matter of circumstance, the Nosferatu poster survived and eventually made it to me. This is another one-of-a-kind piece. There isn’t any other pieces from that film that are large poster format. That’s the only large poster piece on Nosferatu that’s ever been found. That was the predominant Mummy poster, until the one that I had acquired in 1989 came around. This one brings out the more romantic aspect of these movie posters. In the Thirties, romances were a big thing that put people in movie theater seats. Even though these were horror films from the Thirties and Forties, there was always a love interest. To capitalize on that, they would play up the romantic sentiment in the images. They would always put in tag lines like “It comes to life” or “A passion that has lived for a thousand years,” or whatever the tag line is. It was always relationship-based or had a certain sort of romanticism to it. That’s what you see in most of the posters from the Thirties, but this Mummy poster really steps up the romanticism. To see that poster live, in the flesh, it’s amazing. That was one of my most recent acquisitions. As a collector 20 or 30 years ago, I used to daydream about having a Frankenstein three-sheet, until one was found about two or three years ago in a boarded-up projection room in Canada. They opened the room up and there it was, voila, on the wall. It’s the only Frankenstein three-sheet ever known to exist. It survived by accident, like most of this stuff. It’s one of my favorite posters because it’s one of my favorite films. I love the image of Boris Karloff as the monster. It’s so iconic. The woman at the bottom is actually a play off a classical painting. 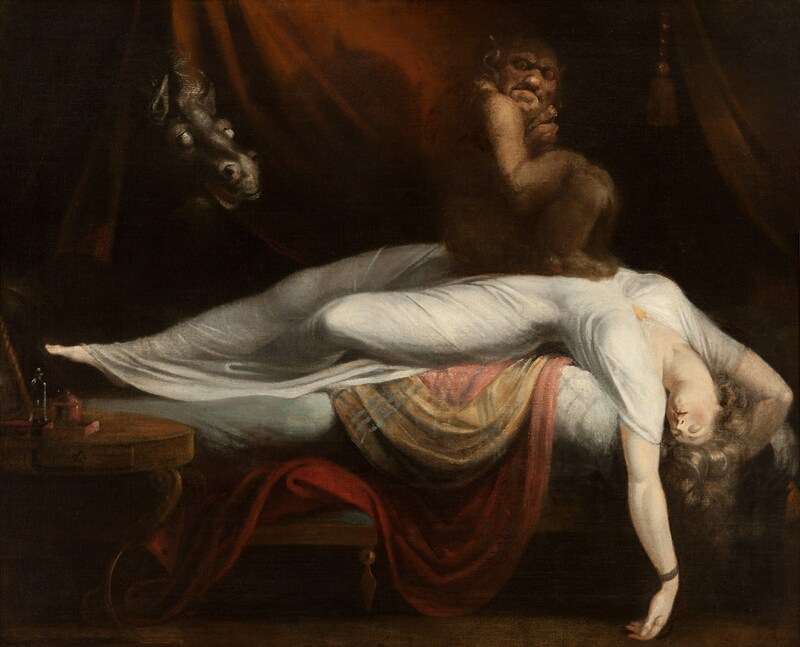 In Henry Fuseli’s The Nightmare , there’s a woman draped over a bed and a demon is sitting on her. Creature From the Black Lagoon was the film that started the Fifties horror craze. It’s about this creature who was found and scientists try to save it, but everything goes horribly amok. That ushered in the whole “science gone wrong, evolution taking a turn and someone discovering something that wasn’t supposed to be” trend, and it became one of the prevailing themes over the course of the Fifties. If you look at that poster and then you look at the poster designs for films that come after that, you can see a direct correlation and a direct influence that Creature From the Black Lagoon had on almost all of the movies to come after in the Fifties.